These workshops can be delivered live or via teleconference, various lengths and levels of interaction can be tailored to fit your needs. Many of them find (to their surprise!) that they have “the right stuff” to for sales success. Fortunately, lack of a sales background is not an impediment to success. Sales ability is NOT an innate skill. People who say “some people have it and some people don’t” haven’t seen the results we have seen! Sales, like flying, can be taught and learned. Just like flying, there are processes, equipment, and checklists that can make it a lot easier to be successful. How your lack of sales skills and discomfort with sales can hurt you and your organization. 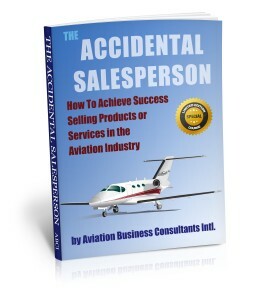 The most successful sales styles for the “aviation personality” and demographics. Simple, non-threatening sales and marketing tactics that work well in the aviation industry. A color “cheat sheet” handout with outlines and templates for sales activities. “Non-salespeople” who find themselves with sales responsibilities.